The Oscars were really good this year (definitely much better than last year’s show.) Where to begin? The opening montage of every classic moment/actor digitally animated… wow. For a classic film freak like me, it was fun trying to see how many movies I could name. Then the comedy bits started. I loved it when Jon Stewart woke up in bed with George Clooney. “Is this a dream?” “No.” Great way to start the show. Stewart’s first few jokes completely bombed but after that he picked up steam. Then he lost it again. That’s okay. 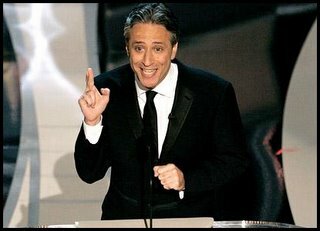 Nothing can stop me from loving Jon Stewart. I loved the tribute to Westerns and the innuendos. “The gayest genre” according to Stewart if you watched Oprah today. Best Supporting Actor goes to… George Clooney, as predicted. He gave a great speech. “All right, so I’m not winning director.” Then he added, “I’m proud to be out of touch”. 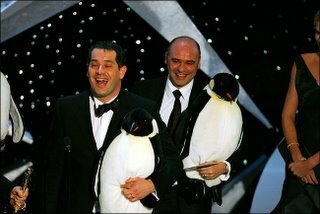 March of the Penguins won best documentary, although it should’ve gone to Enron. Still a great movie nonetheless and I loved how the director (I forget his name) dedicated the award to all the children who saw the film and how hopefully it could influence then when they’re making the important decisions (with environmental issues and such) by 2041. 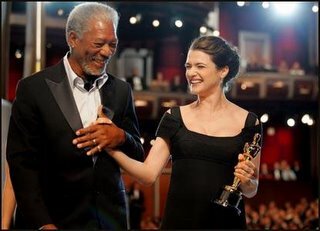 Rachel Weisz winning was awesome and she looked gorgeous for being 7 months pregnant. In her speech she thanked those who do the humanitarian work like her character did in The Constant Gardener. I guess the old fart’s don’t run Hollywood afterall. I mean, 36 Mafia won for best song. By far the most excited (and more shocked than the cast of Crash) to win. 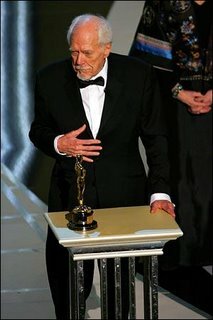 Robert Altman, director of M*A*S*H and Nashville, received the honorary oscar. Well-deserved. He’s been denied too long. His next feature is A Prarie Home Companion. Meryl Streep and Lindsay Lohan star in a great ensemble cast. 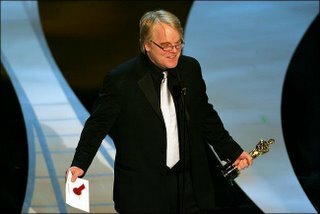 Philip Seymour Hoffman won Best Actor for his role as Truman Capote in Capote. And he dressed for the occasion. Another shocker. Reese Witherspoon won. 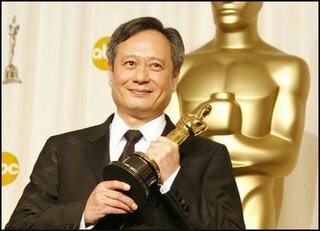 Love Ang Lee. Great director. He deserved it for Brokeback Mountain. But the best moment of the evening had to be when Crash pulled the biggest upset in recent year’s. Yes, I was expecting that it could happen and as the night went on, it was becoming a little more clear to me that it could, but stilll I was shocked. My jaw literally hit the floor. And then I was pissed. Why? The acceptance speech was cut off. Come on now. 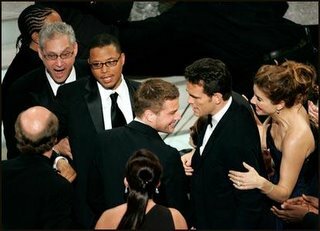 They make this big deal during the show to promote great Oscar moments and the producer ruin one by turning off the mic. I’ll respond to the controversy surrounding this win tomorrow. Lauren Bacall. Need I say enough. The montage tributes to epics, film noir, and biopics. Itzhak Perlman, playing selections from each nominated score. 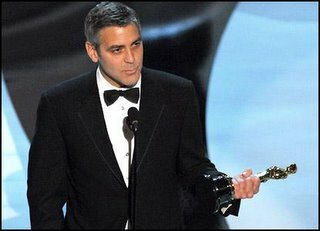 Stewart, ” “‘Good night and good luck’ — the line that Mr. Clooney ends all of his dates with.” The look on Clooney’s face… priceless. 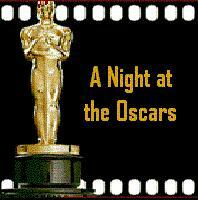 Overall a great night at the Oscars. Can’t wait until next year. I’m thinking Scorcese could finally win. It takes a lot to impress me at the movies and I speak for most people when I say that what I to know is why I just spent 10 dollars only to be mildly impressed. Seriously. The only two times I can really remember being completely enthralled at the movies was when I saw Million Dollar Baby in January and The Lion King when I was 5. This movie makes it three. Now, my adventure to see March of the Penguins began when my big sis Kate told me showed me the preview on the web. 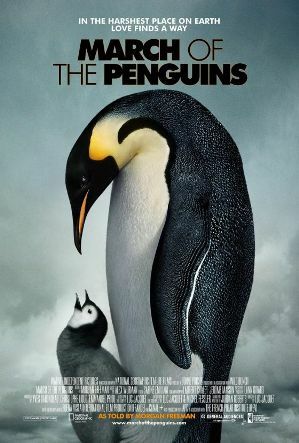 Rarely do I anticipate any film, believing that I will only be disappointed if I expect too much, but because penguins are another one of my teeny tiny obsessions, I was excited for this movie. What made March of the Penguins so memorable was not only the film, but where I went to see it. I spent four days last week with Kate in Washington D.C. and we wemt to see this movie, at the AFI Theater in Silver Spring. March of the Penguins follows the Emperor penguins of Antarctica as they make an incredible and exhausting journey from the ocean to the place where they were born in order to mate and start their families. These penguins battle freezing winter storms, starvation, and sea lions all for the love of their babies. French film maker Luc Jacquet, and cinematographers Laurent Chalet and Jerome Maison, followed the Emperor penguins in their native habitat for the nine month mating season. As I think about this documentary in retrospect, it does remind me of The Lion King. (Work with me on this one.) Aside from the obvious animal kingdom references and the notion of family, it brings an element to a film suitable for young children and that is the simple reminder that life is not easy and that not everything goes perfect. If I were seven or eight years old, the image of that cute and cuddly baby penguin frozen to death would forever be burned into my mind. The film in the entirety is not depressing at all. In fact, it is a celebration of the animal kingdom’s ability to survive and outlast and how in certain ways the Emperor penguin, perhaps the most majestic bird on Earth, is like humans, searching for family and happiness. It is a breathtaking film that leaves a lasting impression on anyone who watches it. Believe me it is worth the 10 dollars to see in the theaters, unlike that latest Tom Cruise vehicle that shall remain nameless. And the added bonus is that you get to spend 80 minutes listening to narrator Morgan Freeman’s dreamy voice.